Italian rabbi and liturgical poet; lived at Bari in the twelfth century. He was one of the teachers of Samuel b. Naṭronai; and his signature, with those of many other rabbis, is appended to a responsum found in Samuel's novellæ on Maimonides ("Yad," Ishut, xxiii. 14). 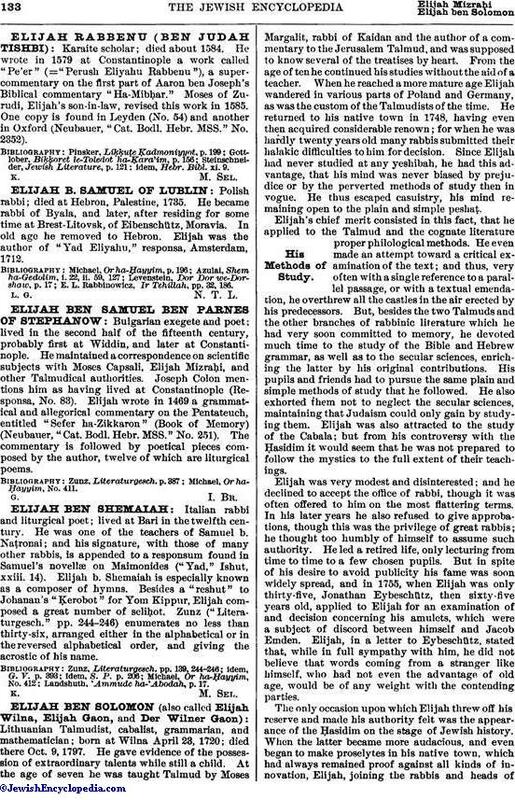 Elijah b. Shemaiah is especially known as a composer of hymns. Besides a "reshut" to Johanan's "Ḳerobot" for Yom Kippur, Elijah composed a great number of seliḥot. Zunz ("Literaturgesch." pp. 244-246) enumerates no less than thirty-six, arranged either in the alphabetical or in the reversed alphabetical order, and giving the acrostic of his name. Landshuth, 'Ammude, ha-'Abodah, p. 17.